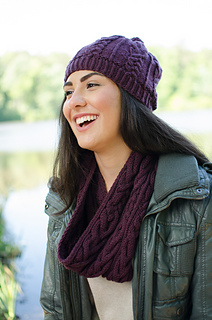 Note: Pattern includes instructions for both the Curvilinear Hat and Cowl. 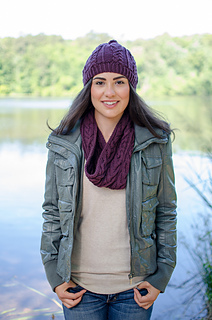 Sweeten up your Fall wardrobe with the Curvilinear hat and cowl. 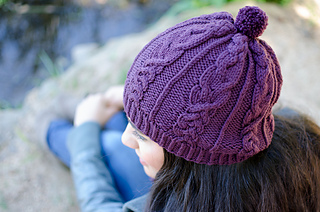 The hat is worked from the brim up and features a twisted rib brim and an 8 stitch cable. Adding the pom-pom gives the hat a cute touch, but it’s optional. 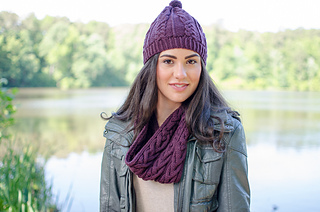 The cowl has a 12 stitch cable and the edges of the cowl are bordered by twisted stitches. The cable has pretty twists and turns and crisscrosses into each other. A row of twisted stitches are used to separate the cables on a background of purl stitches. Note: Both hat and cowl can be made with 3 skeins. For just the hat, you will need 1 skein. For only the cowl, you will need 2 skeins. US 7 4.5 mm circular needle, 16”; US 9 5.5 mm circular needle, 16” and a set of dpns. Spare needle for bind off. Optional: Clover Pom-pom Maker 1 5/8” size. Hat: 22 sts and 27 rows = 4” in Hat Cable pattern (in the round) with larger needles, blocked. Cowl: 33 sts and 21 rows = 4” in Cowl Cable pattern, blocked.